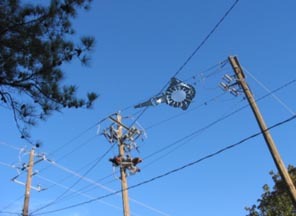 Odd, aerial object above power poles near construction site in May 2006, in Birmingham, Alabama. Photo by Mr. Smith. Return to: Birmingham-Type "Drone" Seen At Barksdale AFB, La., in Mid-1980s. Return to: Previous Odd Aerial "Drone?" Earthfiles. Return to: Engineer Comments About Odd Aerial "Drone?" Earthfiles. Return to: Odd Aerial "Drone"? Photographed Again Over Capitola, California. Return to: Letters About Unidentified "Drone" Aerial Objects. May 25, 2007 Sequoia National Park, California, and Birmingham, Alabama - As the intensity has risen this week to explain away the Lake Tahoe, Capitola and Central California Chad images as Photoshop and/or "viral promotional films," I have interviewed a California resident who worked for the state government in the Department of Developmental Services in mental health for twenty-five years before recently retiring in 2006. Shirley was born in Ventura County, California, and earned her Psychiatric Technician degree from Ventura Community College in 1978. I have her full address, contact information and academic background, but she has applied to work in another state agency, so has asked to simply be identified as Shirley from the Central Valley of California. She does not want the chaos surrounding the images to affect her new employment. But she wanted the public to know that the Chad photos match a dragonfly-like aerial object she saw two years ago.